Substitute Edinson Cavani scored his sixth goal in four games as league leaders Paris St-Germain hit back to take a point at third-placed Reims. The Champions looked to be heading for their first defeat of the season when teenager Theoson Siebatcheu put Reims ahead six minutes from time. But a minute later Cavani fired home a low shot to take Paris a point clear of Rennes at the top of the table. Cavani and recent signing Angel Di Maria both started on the Paris bench. Coach Laurent Blanc brought the pair on with 25 minutes to go as his side looked to avoid failing to score for the first time since losing 2-0 to Barcelona in April's Champions League quarter-finals following a bad headed miss by Zlatan Ibrahimovic. But it was Reims who went ahead when substitute Siebatcheu, 19, converted a pass from Nicolas de Preville with a shot into the bottom corner. The lead lasted little more than 60 seconds, though, as Uruguay international Cavani, 27, calmly steered the ball home from 15 yards to claim his sixth goal of the season and secure a second successive draw for his side. "It would have been an injustice if we had lost this match but we're disappointed with the result," said Blanc. "We should also have scored more goals. We just were not nasty enough, in the good sense of the word." 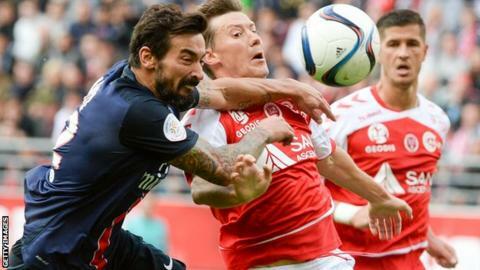 Elsewhere, Caen went above Reims into third place as they beat winless Montpellier 2-1. Corsican side Gazelec Ajaccio remain bottom of the table but scored their first ever Ligue 1 goal in a 2-1 defeat at Guingamp thanks to a first-half strike from Kader Mangane . Nice won 3-1 win at Bastia and Angers beat fellow newly-promoted side Troyes 1-0. Match ends, Reims 1, Paris Saint-Germain 1. Second Half ends, Reims 1, Paris Saint-Germain 1. Anthony Weber (Reims) wins a free kick in the defensive half. Foul by Gregory Van der Wiel (Paris Saint-Germain). Diego (Reims) wins a free kick on the left wing. Offside, Paris Saint-Germain. Thiago Silva tries a through ball, but Ángel Di María is caught offside. Attempt missed. Thiago Silva (Paris Saint-Germain) header from the centre of the box is too high. Assisted by Ángel Di María with a cross following a corner. Corner, Paris Saint-Germain. Conceded by Hamari Traore. Foul by Theoson Siebatcheu (Reims). Edinson Cavani (Paris Saint-Germain) wins a free kick in the attacking half. Goal! Reims 1, Paris Saint-Germain 1. Edinson Cavani (Paris Saint-Germain) right footed shot from the centre of the box to the bottom left corner. Assisted by Javier Pastore. Goal! Reims 1, Paris Saint-Germain 0. Theoson Siebatcheu (Reims) right footed shot from the centre of the box to the bottom left corner. Assisted by Nicolas de Preville. Blaise Matuidi (Paris Saint-Germain) is shown the yellow card for a bad foul. Corner, Paris Saint-Germain. Conceded by Aissa Mandi. Substitution, Reims. Theoson Siebatcheu replaces Grejohn Kyei. Attempt missed. Javier Pastore (Paris Saint-Germain) right footed shot from outside the box is too high. Assisted by Layvin Kurzawa with a headed pass following a corner. Corner, Paris Saint-Germain. Conceded by Anthony Weber. Substitution, Paris Saint-Germain. Blaise Matuidi replaces Benjamin Stambouli. Grejohn Kyei (Reims) is shown the yellow card for a bad foul. Foul by Grejohn Kyei (Reims). Attempt missed. Grejohn Kyei (Reims) header from the centre of the box misses to the left. Assisted by Diego with a cross. Attempt saved. Jaba Kankava (Reims) right footed shot from outside the box is saved in the centre of the goal. Assisted by Franck Signorino. Attempt saved. Zlatan Ibrahimovic (Paris Saint-Germain) right footed shot from outside the box is saved in the centre of the goal. Assisted by Layvin Kurzawa. Attempt blocked. Nicolas de Preville (Reims) left footed shot from outside the box is blocked. Assisted by Frédéric Bulot. Benjamin Stambouli (Paris Saint-Germain) is shown the yellow card for a bad foul. Foul by Benjamin Stambouli (Paris Saint-Germain). Nicolas de Preville (Reims) wins a free kick in the defensive half. Substitution, Paris Saint-Germain. Ángel Di María replaces Ezequiel Lavezzi. Substitution, Paris Saint-Germain. Edinson Cavani replaces Lucas Moura. Attempt missed. Zlatan Ibrahimovic (Paris Saint-Germain) left footed shot from the left side of the box is close, but misses to the left. Assisted by Lucas Moura. Javier Pastore (Paris Saint-Germain) wins a free kick on the right wing. Foul by Antoine Devaux (Reims). Attempt missed. Zlatan Ibrahimovic (Paris Saint-Germain) header from the centre of the box misses to the right.